It is with sadness we announce the passing of Lenora Gertrude Muise, 93 years of Springhill, NS. Lenora passed away on Thursday, November 1, 2018 in Cumberland Regional Health Care Centre. Born in Springhill, NS, she was a daughter of the late Howard and Marion (Ellis) Lowe. Lenora worked as a Riveter at Canada Car, working on the planes used to train the RAF pilots to fly in the battle of Britain. She was a devoted wife, mother, grand and great grandmother. She was a very independent woman, living on her own after her husbands passing for over 25 years. 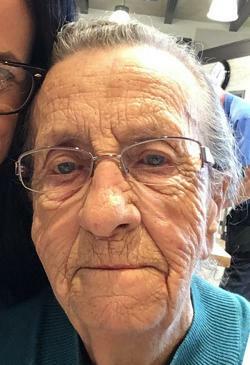 She loved to socialize, hang out at Tim Horton's, attend Bingo and loved to share her wonderful sense of humor. She is survived by her son Charles, Springhill, NS; 2 grandchildren, Bethanie Muise (Blair Hansen), Bridgetown, NS and Alyssa Gouchie (Stephanie Seaward), Cole Harbour, NS; 3 great grandchildren, Zachery Burris, Koryssa Burris and Hunter Hansen. She was predeceased by her husband, Louis Muise in 1991. Donations in memory of Lenora may be made to the Heart and Stroke Foundation, the Canadian Cancer Society, or the charity of your choice. Sharing of memories and condolences may be made to the family by visiting Lenora's online memorial at www.brownsfuneralhome.com or through the A H Brown Funeral Home Facebook Page. Heart and Stroke Foundation, Cancer Society, Charity of your choice.